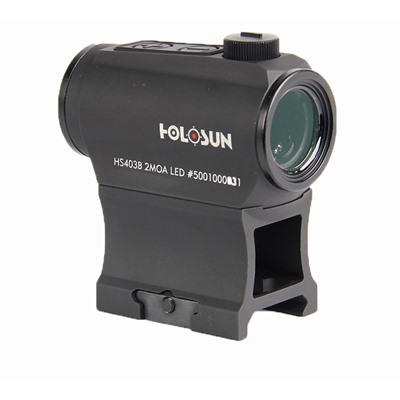 Compact-sized red-dot optics are all the rage for fast-action handguns and modern sporting rifles, and the Holosun HS403B Micro Red Dot Sight is purpose-built to give gun owners an easy aiming solution. The Holosun HS403B Micro Red Dot Sight is constructed with the company's low-output LED technology, meaning that the optic can provide thousands of hours of dependable use on just a single battery. In addition, the housing is built for added durability and ruggedness. The dot measures 2 MOA in diameter, allowing for precise, rapid aiming at any distance. Each Holosun HS403B Micro Red Dot Sight ships with a low mount and a 1/3 co-witness mount designed for modern sporting rifles equipped with a front-sight gas block.